After Universities became independent from monasteries, they grew, were divided in faculties and opened to the masses since the 1950s. A university’s district had to be created. Recently, Bouwkunde itself deserves space and functions comparable with a small city. So, why don’t we build a small city for architecture students? It is the chance to absorb the qualities of a densed city with its small streets and squares for the public life, for exchange, assemblage, presentation and celebration; and its different sized buildings where the studying, researching and working takes place. The faculty can even grow on demand like a city house by house. Consequently, the appearance of new Bouwkunde will not be apprehended at once, maybe one will need some time to find the the routes, because there are a lot offered on different levels. There are not only passages, alleys and squares on the ground level that access the most important faculty’s and public functions. There is also an access system invented on 3rd floor to get to the most important common functions like labs and workshops. We will consume the maximum free area between canal and parking for the new structure. Considering homogenous 6 storey buildings, we receive 50 % for open spaces. Three centrical postitions are defined for squares, where the major functions (lecture halls, library, restaurant and public devices) are placed. 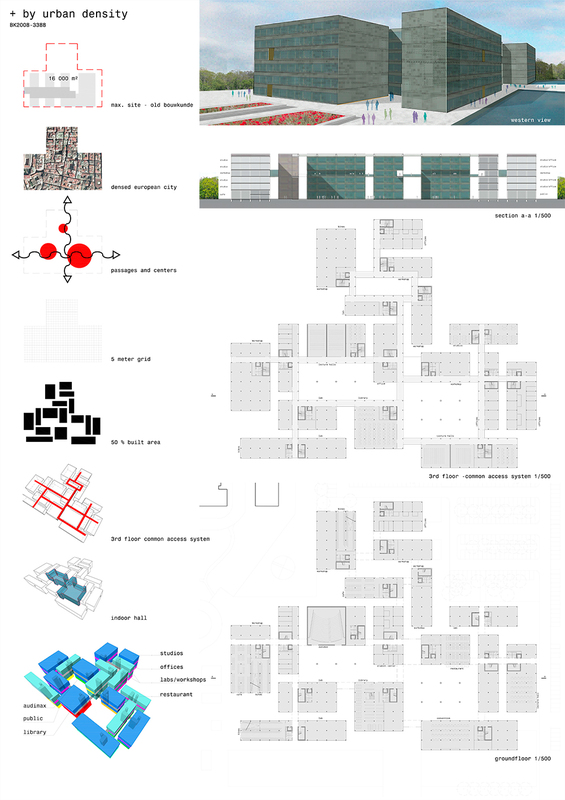 The genererated building layout is based on a 5 meter construction grid, a varying buildingdepth of 10 to 20 meters, passages on the site and smooth transition at the borders to the surrounding. Zoning inside the buildings is similar to city. The more public functions are placed on the ground floor to the main squares and the more common functions are found on the third level in the middle of the buildings. The sceleton structure enables office and studio utility in all demands in the rest of the buildings. The two main squares will be the heart of new Bouwkunde, therefore they receive an indoor condition. The created glass hall connects the surrounding buildings and acts as an internal an external communication platform for the faculty.